Kituba (or Munukutuba or Kikongo ya leta) is listed by Ethnologue as a Kongo-based creole. Laari: South of Pool Region, west and northwest of Brazzaville (Congo). Also spoken in NW Angola. 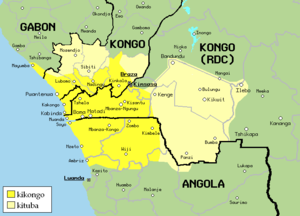 A map from Wikipedia on right shows areas where Kikongo and Kituba are spoken. Population total all countries: 1,056,126. Kituba is a means of communication among various language groups. There exists an indigenous script of recent origin called Mandombe which is used mainly in the Kimbaguist church. The Liboke ya Congo project may have some plans for this. The numerical importance of Kituba might make it a candidate for localisation. The diversity of Kongo dialects might pose challenges for localisation. Should Kituba and the Kongo cluster be given separate listings? What about Yombe?